Released September 2015 from Heiwa. 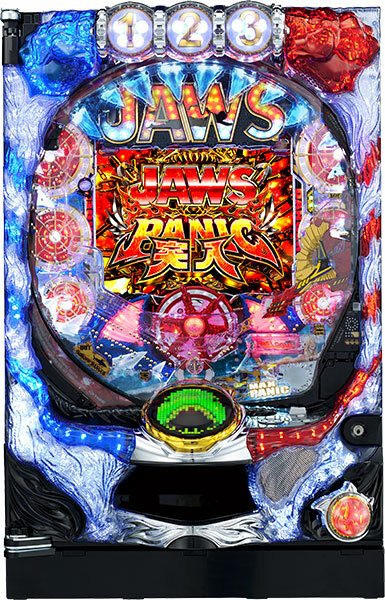 Today, we will be introducing a pachinko machine with the theme of “Jaws”, a masterpiece of a disaster movie. This machine expresses the fear of getting attacked by man-eating shark to the maximum. As the key word of “defeat it before getting eaten” states, desperate struggle against the monstrous shark is the characteristic of this machine. Player gets to experience a tense atmosphere, just like the feeling you got when watching this movie. Familiar music doubles the fear of a player, and movie fans can agree on the excellent workmanship!! New shipment =New Lower Price!